Select the Periscope lessons that meet your needs. Plan 30-45 minutes of class time for each lesson. For each lesson, do at least two cycles of communal viewing, small-group discussion, and whole-class discussion. Each cycle of viewing and discussion should be focused on a particular question or prompt. 1. What is Periscope and what is it for overall? Periscope’s primary aim is to help physics instructors see authentic teaching events the way an expert educator does – to develop their “professional vision” (C. Goodwin, American Anthropologist 96(3), 1994). This development of professional vision is particularly critical for educators in transformed physics courses, who are expected to respond to students’ ideas and interactions as they unfold moment to moment. 2. What does a single Periscope lesson consist of? 3. What do I need to do to prepare to use a Periscope lesson in my class? The Periscope website offers a wide variety of lessons on numerous topics. Select lessons that meet your needs. The Physics Content, Pedagogy Content, and STEM-wide filters may help you find what you want. Each cycle should last 10-20 minutes, and there should be a minimum of 2 cycles. Therefore, you should schedule a minimum of 30-45 minutes for a single lesson. Make sure your classroom has the proper facilities for playing video (with audio) to the whole class. Showing the video on a large screen to the whole class is technically simpler than having participants watch it on their individual computers. Prepare a copy of the lesson handout for each participant (print two-sided and in color, if possible). Participants will use these to refer to the task for students, the transcript, and the discussion questions. Review the lesson guide for each lesson that you use. Plan in advance what discussion prompts or prompting techniques will best suit your circumstances. Though there are sample discussion prompts on each handout, these are only one possible source of prompts. You can use Periscope lessons for self-study by watching the video episode and reflecting on the sample discussion prompts. In this case, print out the handout so that you can easily refer to it while watching the episode, or open both the episode and the handout on a large screen. 4. How do I introduce Periscope to participants? Periscope episodes show diverse, intimate examples of what best-practices physics teaching really looks like at several different institutions around the country. Periscope episodes help you feel like you are really there for a moment in teaching and learning, sometimes more so than a live observation; this sense of being in on the action gives insight into what happened and why. When we all watch the same teaching and learning event together, we learn which of our observations and interpretations are universal and which are unique. When we watch the same teaching and learning event more than once, we can test our initial intuitions against evidence in the episode. When we discuss teaching and learning events together, we learn about the principles and values that motivate us as instructors and as students. Periscope lessons help us practice noticing and interpreting what happens in real teaching and learning events, training ourselves to notice and interpret what happens in our own classrooms. Periscope lessons help us practice applying broad principles of teaching and learning to specific moments in specific classrooms, without any students being harmed in the process. 5. How do I establish a safe and respectful atmosphere for discussions? Video 1 [Values]: A facilitator explains that Periscope lessons often touch on deeply-held values about teaching and learning. Discussions about teaching often involve values that run very deep for the participants. Maintaining a respectful and safe atmosphere is crucial not only for developing a learning community among your participants, but also for enabling your participants to identify and share their values, examine them thoughtfully, and consider other possible perspectives. Strive to characterize what’s going on in the episode according to the people in it. Describe events in a way that the participants themselves would likely agree with if they were present. Limit discussion to what we see happening in the episode (observable evidence) and what we think it means (evidence-based interpretation). Set aside opinion, judgment, and critique. Recognize that while we will likely all agree on observations (e.g., “The LA never spoke”), and we may persuade each other of interpretations (“Those two students have the same idea”), value statements (such as “The LA should not have done that”) are personal: they provide an opportunity to learn about the person speaking, and may reveal commitments and priorities that are not universally shared. 6. How do I introduce each specific Periscope lesson? Each time you start a new Periscope lesson, give participants a sense of what the lesson will be about. This information is summarized in the lesson title and introduction. You might also share the lesson objectives with them: these are stated in the Lesson Guide for each specific lesson. This should only take a minute. Explain that you will be watching a video episode together of students who are working on the “Task for students” that is reproduced in the box on the handout. Have participants answer the “Task for students” themselves and discuss the right answer with each other. That way they start watching the episode with a sense of what the students in the episode are thinking about. Participants can spend very little time or a lot of time on the “Task for Students,” depending on their background. Decide how much time you want them to spend on the physics question vs. discussing the teaching issues in the episode. We usually try to keep the time for the “Task for students” down to five minutes or less. A correct answer to the “Task for students” is in the Lesson Guide for each lesson. 7. 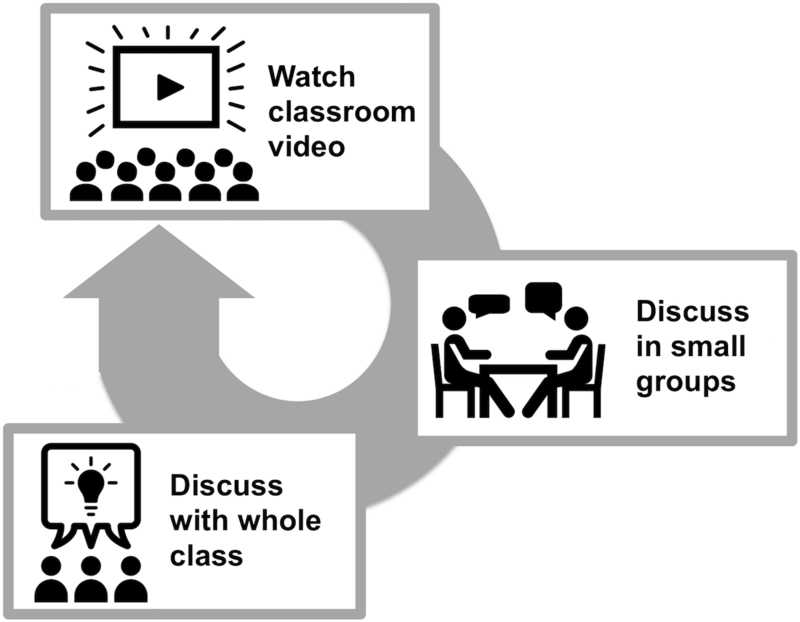 How do I use the three-stage cycle of communal viewing, small-group discussion, and whole-class discussion? The main part of a Periscope lesson is a 10-20 minute cycle of communal viewing, small-group discussion, and whole-class discussion that repeats at least twice. Each cycle of viewing and discussion should be focused on a particular question or prompt. The first stage of each cycle is for the large group to watch the episode together. Tell participants to watch the captioned episode rather than following along with the transcript, so that they can see the action as well as hear what is said. When you start the episode, say something simple such as “Okay, let’s watch,” without any special instructions. Alternatively, try having participants write individually in response to the prompt before small-group discussion. This can give people with a different interactional style the opportunity to respond in a different way. The complete cycle (communal viewing, small-group discussion or writing, large-group discussion) should repeat at least once, usually with a different prompt each time. With more than one cycle of viewing, participants experience seeing different things in an episode than they saw the first time or reconsider inferences that they had made. Both of these experiences are important for the development of professional vision. 8. What are good discussion questions or prompts? Each cycle of viewing and discussion addresses a particular question or prompt. There are many possible sources of questions and prompts to stimulate discussion of Periscope episodes. The first prompt, however, should always be completely open-ended. These natural interests and areas of expertise or development can shape the rest of the discussion. Some participants are impressed with the students’ persistent questions and efforts to construct a model. Others see the students as off-task, since the questions they are addressing are not on the worksheet. Some participants are concerned about the model that this group seems to arrive at, since it has incorrect features. Some participants especially notice the students’ gestures, or the gender dynamics, or the fact that some of them don’t finish their sentences. Video 2 [Using an open-ended prompt]: A facilitator uses an open- ended prompt with a group of faculty. Video 3 [Evidence]: A facilitator explains to faculty participants how she encouraged them to ground their statements in observations. Video 6 [Handout Prompt]: A facilitator leads a discussion of one of the sample discussion prompts about student ideas in electrostatics. We hope that different participants will see the events in the episode differently, perhaps even taking different sides on a question. Subsequent viewings may either develop consensus or affirm distinctive viewpoints. Alternatively, sometimes when we run a large class, we subdivide the class, assigning different small groups to different prompts. This covers more territory in a shorter time. A risk with using the sample discussion prompts on the handout is that sometimes participants treat the handout like a worksheet, jotting down short answers and moving on to the next question. If you find that this is happening in your class, you might prepare a different handout for participants without the sample prompts on it. (All handouts are editable.) In this case you might choose to print a different copy of the sample prompts out for yourself only, to keep at hand during the discussion. Sometimes when we run a class this way, we give copies of the questions to the participants at the end of the session. Write participants’ contributions on the board as they make them. While you are writing, refrain from response, judgment, or follow-up questioning. Once you have a list of contributions on the board, look it over. Choose (or co-choose with the participants) which contribution(s) to discuss in greater depth. Use your chosen contribution as the prompt for the next round of viewing. You may find it valuable to classify (and lead the group in classifying) the contributions that you write on the board into categories. Some frequently useful categories are questions, observations, claims or inferences, and value statements. Questions provide natural prompts for future cycles of viewing and discussion. Participants are likely to all agree on observations, but there may be an opportunity to make more detailed observations about a particular thing (e.g., Was the LA still there when Alanna said that? What gesture did Ben make right after? What was Alicia’s expression when Cass said that?). A claim (e.g., “Bella uses everyday language,” “Arianna is surprised”) is likely to be a useful prompt for the next round of viewing: participants can watch for evidence that supports or refutes the claim. Claims and counter-claims often appear in the same list and can be investigated in the same round of viewing. Value statements (such as “The LA should not have done that”) are personal: they provide an opportunity to learn about the person speaking, and may reveal commitments and priorities that are not universally shared. Often, participants conclude that the evidence does not support a clear conclusion, which can be illuminating in itself. We have seen participants have transformative experiences in which they recognize that a certain way they had been interpreting an event is central to their implicit theory of teaching and learning. For this reason, this discussion format is a favorite of ours, especially with experienced participants. However, it also takes the greatest investment of time at the start of a cycle. With many audiences, we elect to use a lesson question or handout prompt instead. Another class of prompts is especially worthwhile for relatively advanced inquiry – when the lesson objectives have already been achieved, or with a particularly experienced group. The following general prompts can lead to increased insight about any episode. You might ask each participant or each small group to select a different channel. Prompt participants to take the perspective of a single student in the episode – to try to live through the episode as that person, foregrounding what they say, see, and do in their attention. You might ask each participant or each team to select a different focal person. 9. Are Periscope episodes authentic episodes of student learning? Yes, these are real (not staged) episodes of student learning; they are ordinary events in best-practices physics classrooms. Video is contributed to Periscope by home institutions that do their own video recording for the purpose of researching physics learning. Students have all consented to video documentation of their work and are in that sense aware of the cameras, but they normally do not attend to the fact that they are being recorded. 10. May I share Periscope video with others? You may share Periscope videos with faculty, teaching assistants, learning assistants, and other instructors. You may show Periscope videos at professional meetings for educators, such as meetings of the American Association of Physics Teachers. You may not show Periscope videos publicly or post them publicly online, e.g., as unprotected YouTube videos or on your publicly accessible class website.